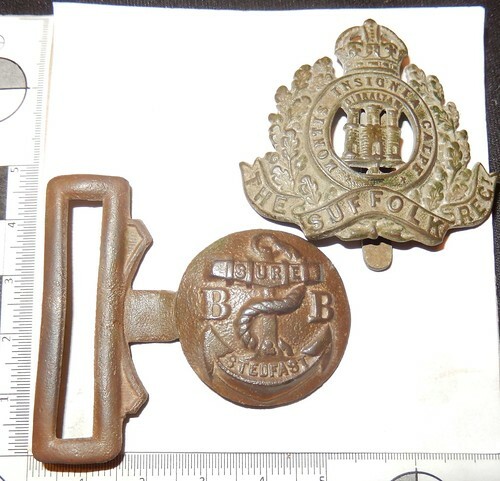 Can I Make this Old Cap Badge Look Like New Again? I found this old labor corps military cap badge today, it's in not bad condition, but a bit crusty. I am totally new to cleaning things, and don't know what the limitations are. 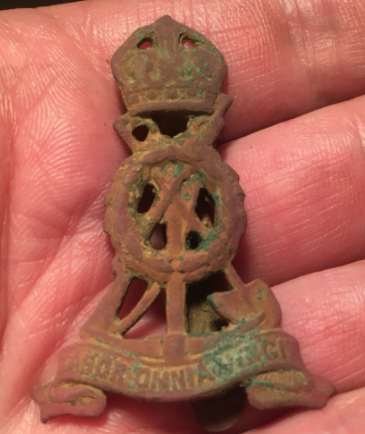 Could I get this cap badge to look like new again, and if so how? I started another thread regarding a very crusty old coin, and someone mentioned ultrasonic. Would that help this badge, or are other methods required? Re: Can I Make this Old Cap Badge Look Like New Again? Ultrasonic will shake off anything stuck to it but it won't actually clean it. The surface of brass is likely to be damaged by being buried for so long so I wouldn't risk ruining such a nice badge. If you are serious about cleaning stuff then read up about it and experiment on junk items before trying out on the better bits. Only if you got it re-plated. It's really best to just leave it as is. It looks good and I personally would do no more cleaning as it will likely be detrimental. Yes as others have said, you could also clean around the letters and other details with a toothpick & damp cotton bud to get the last bits of dirt and bring out the finer details. A light coating of renaissance wax (leave to dry) and polishing will bring out the details and give a shine while also protecting the metal. Its very nice as it is, well found. I think it looks great like that but it belongs to you so if you prefer you can strip the patina off with acid but it still won't look like it did when it was new. I would just polish it with a bit of wax. Just to bring out the high points a touch. The chemicals in the ground tend to attach the brass and it is really hard to get it to shine again. I have a Suffolk regiment cap badge and it has a bit of a shine and I have just tried cleaning a Boys Brigade buckle with little success to get it to shine. Thanks for all the ideas which I have taken on board. If I go ahead and attempt to clean this badge, I will post the results here. Don't do it, there may be regrets. I've destroyed a few and learnt. Looking at you photo the brass has turned a pink colour. This is due to the zinc leeching away. To bring back the brass colour you would have to remove some of the surface. Here is a photo of what's happened. By all means clean it up. Depending how deep its gone you may ruin the badge taking it all the way back to brass. I have found that the brass wire wheels you get with dremels can clean off quite a bit of the dirt and then a soft wheel to clean it further. A good while back as part of a display for the landowner of a site that has seen extensive use by the military, I put the badges in a barrelling machine (I know). I used crushed walnut shells and a little washing up liquid. Six hours later and they looked great in the display case and still do. The mighty Minelab Etrac ! I have to admit the results from the 'barrelling machine' look amazing. However, I'm very cautious about trying some of the methods here - I'd hate for it to go wrong. These are the 2 I tried to clean. The Suffolk badge was corroded but the soft brass brush and brasso cleaned it a bit. Thing is with brasso, when it dries it leave a white powder. The boys brigade badge (pre 1926) was quite dull but the brass brush on a drill, then a bit of brasso with a felt wheel has brought it up quite nicely. I only attempted these are they are pretty solid. To be fair I would just leave yours as it is. I have a Canadian corps of signals which I won't be cleaning. Barrelling seems to reach a point where you think it is almost perfect and surely another couple of hours will be even better ... and it seems to get worse from then on. So when it's almost perfect switch to hourly checks keeping a close eye on the detail. I have cleaned many badges by barrelling. Depending on the grade of abrasives a badge like yours comes up really well. Can be left in the machine for many hours.. The clasp nearly always comes adrift but no matter, araldite puts it back. If the barrel machine doesn't do all the nooks & crannies you can use brillopad or soak in vinegar etc. 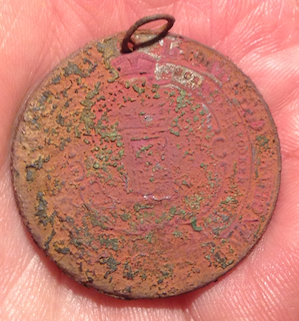 I used to hunt badges with a passion in my youth, I find militaria fascinating. I'd like to try out your barrel technique. Do you reckon the medal below is a good candidate for 'barreling'? Let's face it, it's pretty wasted, so I thought it would make a good candidate. You have nothing to loose but you will probably end up with a shinny blank. Great caution should be taken when contemplating barreling, great for modern beach coins. My view, never use on anything that you value, are unsure of or has a nice patina.